The Gold King Mine near Silverton has been a source of toxic leakage for many decades and may finally get fixed under an EPA Superfund listing. A little over eight months after EPA contractors accidentally released 3 million gallons of toxic wastewater into the Animas River near the scenic ski town of Silverton in Southwestern Colorado, the federal agency has fast-tracked Superfund listing for the mine-riddled surrounding area called the Bonita Peak Mining District. That will bring federal resources to bear in a huge and comprehensive way in order to fix a century-old problem created by long-gone gold and silver mining companies that left massive toxic messes decades before the EPA even existed and well before there were regulations dictating responsible cleanup measures. The EPA estimates there are 500,000 abandoned mines around the country, mostly in the West, that would require $35 billion in federal funding to properly clean up. 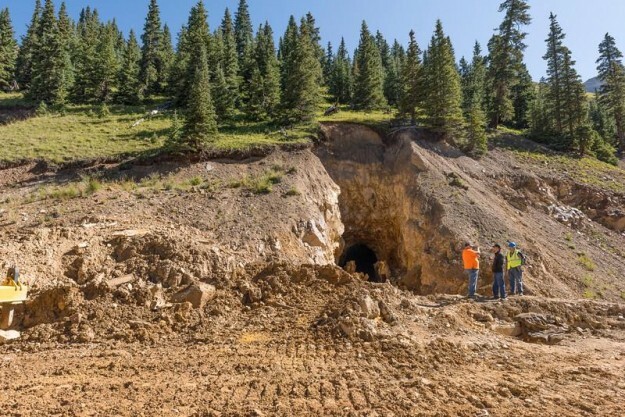 State officials say there are 22,000 abandoned mines in Colorado, with 500 of them polluting various streams with acid mine drainage, killing aquatic life and lowering water quality. EPA contractors were in fact trying to mitigate the buildup of acid mine drainage in the Gold King Mine that every four or five days leaked the same amount that was suddenly and accidentally released on Aug. 5. That amount continues to drain from the Gold King, but now at least the EPA has installed a wastewater treatment facility to leach some of the heavy metals out of Cement Creek before it dumps into the Animas and flows on down to Durango. The EPA is spending an estimated $16,000 a week on the facility after installing it at a cost of several million dollars. The Rocky Mountain Post interviewed Silverton Town Administrator Bill Gardner for an article that posted today (April 7) on The Colorado Statesman website. Gardner praised the administration of Gov. John Hickenlooper for advocating on behalf of local communities in tough negotiations over Superfund listing with the EPA. Silverton and surrounding San Juan County have for many years balked at Superfund listing because of a perceived stigma that could adversely affect the critical tourism industry. However, Superfund cleanup sites have coexisted with resort areas like Vail and Moab for decades without impacting tourism to those popular destinations. Naming it the Bonita Peak Mining District avoids any mention of Silverton or San Juan County, Gardner says, and therefore should sidestep any stigma issues. Plus he adds that cooperation between local, state and federal officials will avoid any negative headlines that could impact the local economy. Gardner scoffs at ongoing acrimony toward the EPA from politicians threatening to sue the agency and publicly shaming it for its handling of the accident. He points out that the agency’s very best field workers are now on the case and working effectively toward a long-term solution. Gardner also discounts the fringe notion that the EPA purposefully breached the mine and released the 3 million gallons in order to move toward Superfund listing. Gardner has been reaching out to earth-sciences experts in academia to make the Bonita Mining District a model of inter-agency cooperation and best practices for cleaning up the thousands of abandoned mines that the mining industry profited from heavily for many decades but failed to properly clean up. “The thing that I’m very passionate about is we’re going to try to use this as an opportunity to make Silverton an earth sciences center, because we’re going to encourage the EPA to use university scholars and other academics to get the best cutting-edge remediation of these mines as possible – hopefully to set a new model for the West,” Gardner said. In a February letter to the EPA backing local community support for Superfund listing, Hickenlooper wrote that ongoing diligence will be required to procure federal funding for the project. Congress for many years has been unable to pass Good Samaritan legislation that would perhaps accelerate cleanup by nonprofit groups, local governments and the modern mining industry by absolving them from some level of liability under federal Clean Water Act regulations. Bipartisan bills sponsored by Colorado’s congressional delegation and backed by resolutions from state lawmakers have so far gone nowhere, in part because environmental groups don’t trust the modern mining industry and also because they seek comprehensive mining reform that would require companies to create a cleanup fund by paying royalties for hard-rock mining on federal land. Unlike the coal and oil and gas industries, hard-rock mining companies, dating back to 1872 mining laws, are not required to pay royalties for mining on public lands.